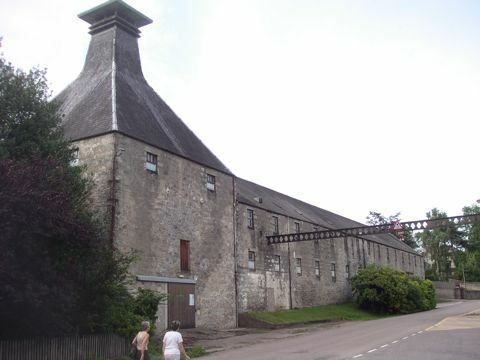 Here’s a picture taken at Mortlach Distillery, the oldest in Dufftown, in 2006. Now, here’s the same photo flipped left/right. As previously mentioned, the position in relation to the viaduct probably makes our distillery Parkmore, which just fits with the period modelled (Parkmore went silent in 1931). But it represents all seven stills at Dufftown so it’s fitting that we should take the best bits where we find them. 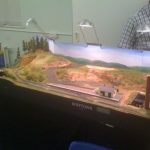 First, and most importantly, the Brighton MRC exhibition, our club show, was a success. Numbers through the door were up, and we got some positive feedback. Pickups and chassis – some locos were only picking up on two wheels, causing problems at points, and two locos essentially pegged out during the show! 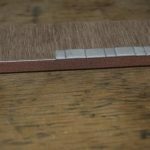 Points and polarity – I have gone off Peco points, because even new turnouts (some are “recycled”) were not switching polarity however much we cleaned the blades, and PL-13 switches will have to be fitted to all of them! Couplings – we standardised on bemo-type couplings, but some of these were at different heights (again – a factor of time) and wagons were left behind with great frequency. Despite all these flaws, the layout proved popular, especially with the youngsters who liked the tunnels (“where’s it going to come out now?”) and the fact that the blue livery made our Peco “James” look like a popular children’s character (“Daddy! There’s Thomas!”). 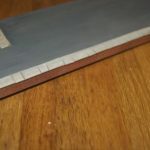 The scenery and the track layout was commented on favourably, too, confirming that we’ve stuck a good balance between operational and modeling interest within the limited space we’ve given ourselves. 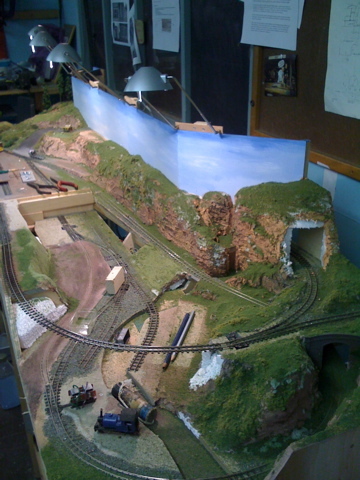 Here are a couple of photos of the layout at Patcham. These were taken on Saturday, by the end of Sunday a number of details had appeared, including the first golfer on the course! Author Simon WoodPosted on 7th November 2008 Categories News3 Comments on Out of Time! Dufftown station is one of the things left over from the original board that never got completed. 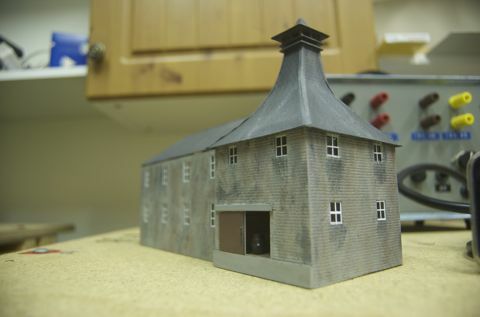 With the intention to scratchbuild Dufftown’s station building, it wasn’t a quick project, but what was needed for the exhibition was… something! 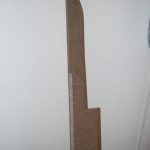 The platform was cut to shape from 9mm ply. This is just a little high for the stock, but it was important for the look that the station had a “built up” platform and this has just enough height. Also there was some readily available! Strips of brickpaper were cut to size for the front, and the edge paved with Metcalfe self-adhesive paving slabs. The top was surfaced with polyfiller and coloured up. 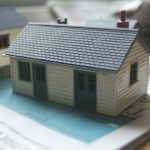 Finally the Will’s wayside station building SS67 was assembled and mostly painted (out of time!) to sit on top. When the original 2′ x 3’6″ board was nearing completion, planning began on the next board. 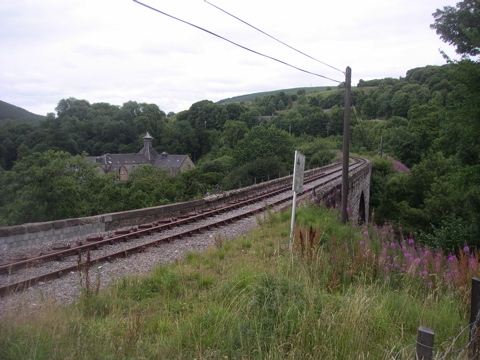 A given was that it would include a distillery with railways sidings, the raison d’etre for Dufftown. But besides providing the unusual “whisky traffic” theme, the choice of location offered some local inspiration for other features that might be modeled. As the line curves towards Keith it crosses a two span viaduct by the Parkmore (I think?) Distillery. 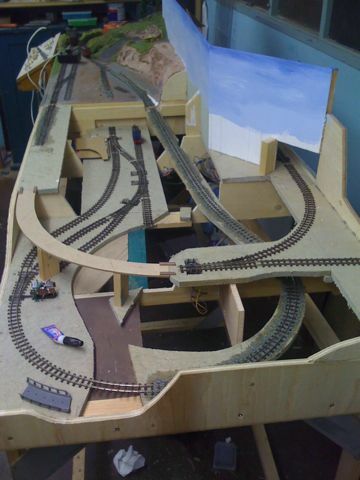 Various plans involving completing the circuit of track over an additional two boards were considered before a fellow club member, Doug Hill, offered the brickyard section from Chickerell Brickworks to incorporate. Thus the final plan, a more modest single board, both completed the circuit for Dufftown and provides a link into the brickworks which will be relocated to a summery Craigellachie from its original Dorset winter. 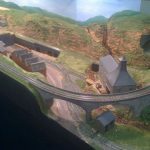 It includes the viaduct and a distillery served by lower level sidings on a spur which (using a lot more of that modeler’s licence) passes under the viaduct. See here for the trackplan. 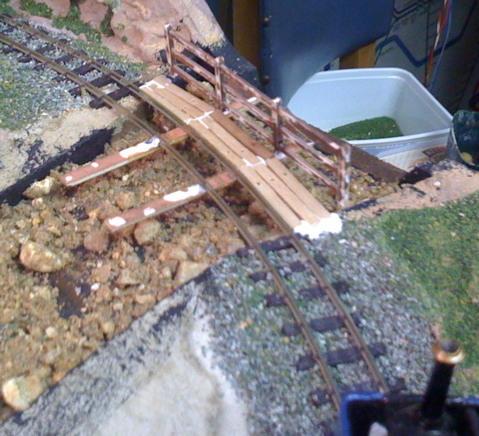 A quickly built model of a rough bridge for the industrial spur over the river was constructed by removing the plastic sleepers from the Peco crazy track and soldering two long lenths of copper sleeper strip in place instead. 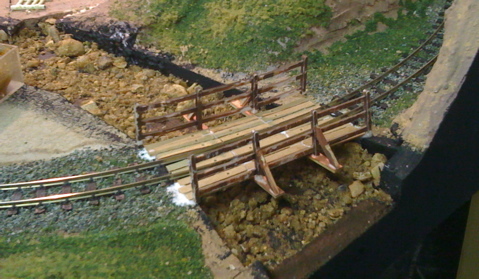 These then act as supports for the handrails and the old (standard gauge) sleepers that form the bridge’s planking. When the glue dries it’ll be painted. There’s still an alarming amount to do with only four days to go, but if we look back at the corner of the layout featured two weeks ago it is possible to see how much has been done. 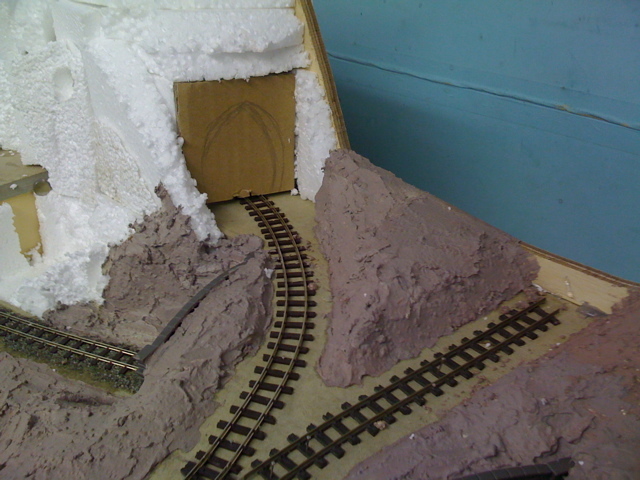 A small amount of rock face still needs painting, the tunnel interior needs to be modeled (and the track there ballasted) and the spur needs to become sufficiently overgrown to hide that plywood. To the left of the photograph you can see the waterfall that still needs water. Tunnel mouths are awkward in 009. Products designed for 00 are too large, those designed for N, besides not being to scale, are too small to accommodate the 4mm stock. 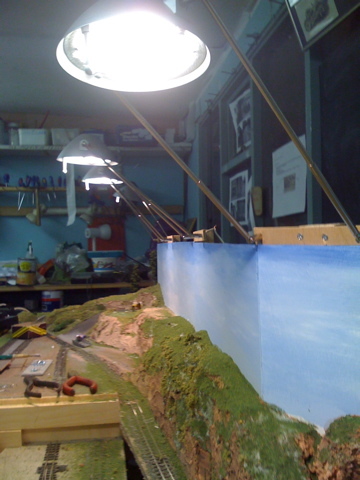 Incidentally, the N gauge wagon that is derailed on the siding is used solely for testing purposes! The solution used here is a Peco single track tunnel mouth cut down. There are various give aways: The tunnel mouth comes pre-coloured with a soot effect in the centre, which helps show up the sides of the V that was reinserted! This will be painted over, though time will probably not allow the more serious mismatch of the central stone to be addressed before the exhibition. 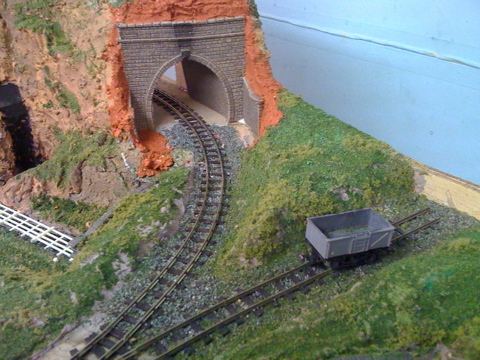 Also the tunnel is more arched than it should be. Five days ago, and the cliffs have been painted and there’s grass everywhere. Legend An apparently plausible account specially prepared by the intelligence or counter-intelligence service to mislead the enemy. 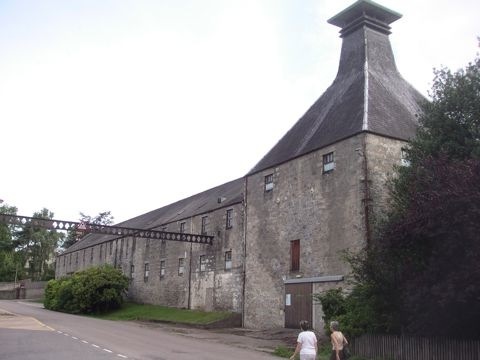 Mortlach distillery opened in 1823 close to the newly established settlement of Dufftown. When, in December 1858, the Morayshire Railway was extended from Elgin to Craigellachie (some 5 miles from Dufftown) the distillery was thriving. A link was needed to bring in grain and coal, and to transport the whisky to Elgin. 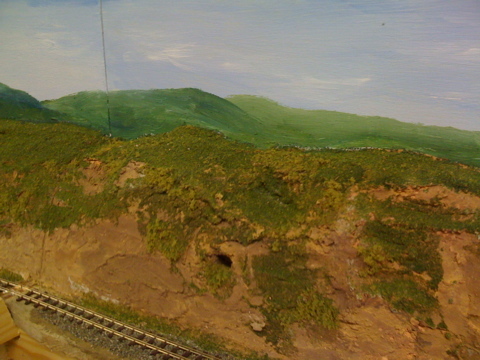 Owing to the difficult terrain along the Fiddich gorge, a narrow gauge railway was proposed. In February 1862 the 2’3” gauge line, from Dufftown down the Fiddich to the Spey at Craigellachie, was opened. During the 1880s and 1890s another 6 distilleries were established in Dufftown, all served by the railway. By the 1930s the whisky industry has begun to decline and the heyday of the railway has passed. However, there is still sufficient mixed traffic to sustain the railway and many of its branches. NB: In fact, the first railway to reach Dufftown was the standard gauge Dufftown and Keith Railway in 1862, closely followed by the Strathspey Railway (which twisted along Glen Fiddich from Craigellachie). A spur was build to serve the distilleries at Mortlach. Passenger services were resumed between Dufftown and Keith in 2001 when the railway was restored by volunteers. The four low voltage halogens from IKEA are now installed. 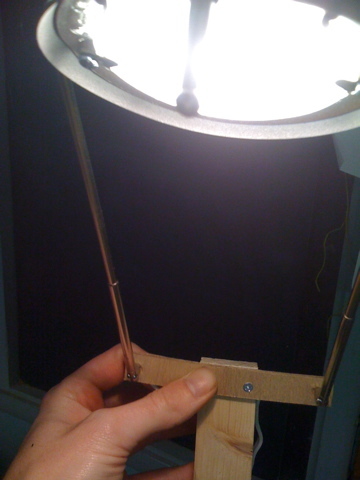 The plastic mounts have been stripped off and discarded and the lamps are mounted on 6mm ply screwed to short battens which slot in behind the backscene. 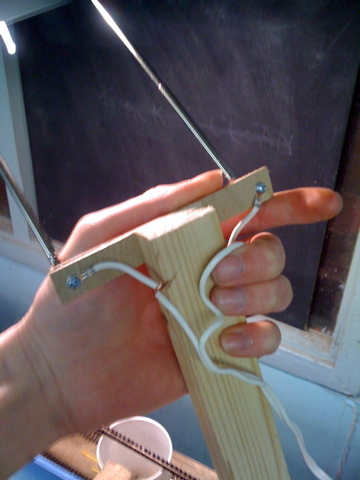 The wire was later terminted in chocky blocks which make it easier to string the lamps together in parallel. After the exhibition, these will probably be replaced with some sort of plug & socket system. The Distillery on Out of Time! One-Ten on Out of Time! andrew on Out of Time!